I n 2005, Robin Stout was appointed President of the Moynihan Station Development Corporation, the Empire State Development Corporation’s subsidiary charged with transforming the James A. Farley Post Office Building into a new train hall named for the late Senator Daniel Patrick Moynihan. 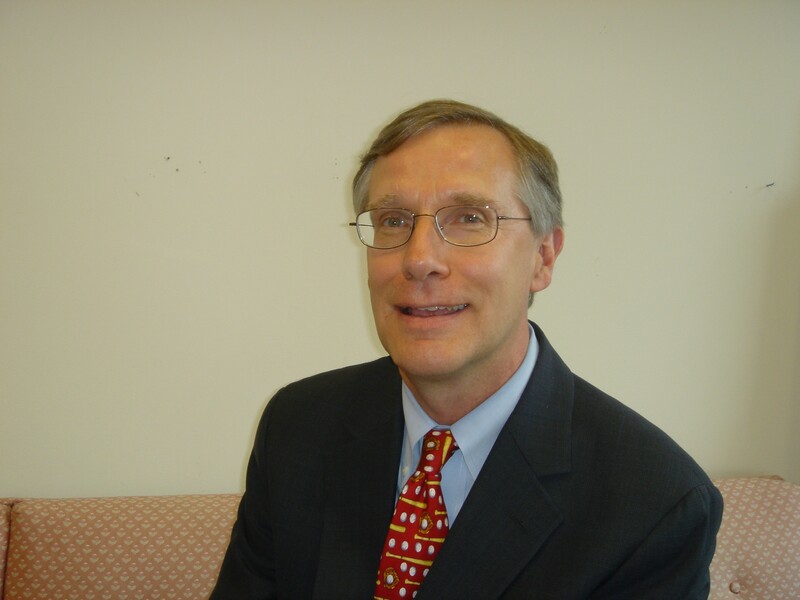 Stout, a Columbia Law School graduate, spent nine years at Stroock & Stroock & Lavan LLP before joining the ESDC as Senior Counsel to the 42nd Street Development Project in 1990. Transforming 42nd Street had Stout touring deteriorating theaters, relocating Times Square businesses, clearing condemned sites, negotiating leaseholds, and preparing for the next stage of condemnations. In addition to the 42nd Street Project, Stout also worked on the Jacob K. Javits Convention Center Expansion Project and the development of One Bryant Park. Stout has enjoyed his time at ESDC, explaining that each development site presented problems with its own solutions. The need for expansion. Before discussing the current plans for the Moynihan Station Project, Stout provided a little history of the Penn Station site. With the help of a map depicting the layout of the rail tracks and the street grid of Manhattan’s west side, Stout explained that in 1910, the tracks were laid out directly under the original Penn Station site between Seventh and Eighth Avenues, with a portion of the platforms extending west beyond Eighth Avenue. To generate more income, the Pennsylvania Railroad encouraged the Postal Service to build across the street so it could use the platforms extending across Eighth Avenue for its “mail by rail” service. The Postal Service agreed, building the Farley Post Office, and installing vertical mail chutes to transfer mail to the tracks waiting below. At the time, the track layout and the Postal Service’s usage was more than adequate for moving around the City’s mostly inter-city commuters. Over the years, however, the intra-city passenger load increased, and with Amtrak, the Long Island Rail Road, and New Jersey Transit all using the tracks, the new Penn Station building became seriously overcrowded. Stout explained that today, passengers riding on the western end of LIRR and NJ Transit trains exit on the portion of platforms running underneath the Farley building. But with no available exits above, passengers often have to walk up to 300 feet east on the platforms to exit from Penn Station. This creates additional congestion on the platforms, as well as upstairs at Penn Station. The original plan. In the early 1990s, the Postal Service began considering plans to relocate mail-processing operations from the Farley building. Senator Moynihan, and others, recognized the Farley building’s potential role in helping to improve Penn Station, and he championed the idea of building an additional train hall within the Beaux-Arts-style Farley building. As Stout pointed out, the plan made sense. By converting the unused mail drops into vertical commuter access points down to the tracks, passenger congestion could be significantly reduced without needing to move one track, or change one brick from Penn Station. Grand ideas. Over the last 15 years the size and scale of the proposed development has fluctuated dramatically. Outside factors led the Postal Service to reconsider the timing of its relocation needs, and Amtrak also reconsidered its planned move to the Farley building. The LIRR and NJ transit tentatively planned on becoming the project’s main tenants, and then Amtrak appeared ready to get back on board. In 2005, the City rezoned the area, creating millions of square feet of development rights to incentivize the development of Manhattan’s west side surrounding Moynihan Station. These changes eventually led to a massive expansion proposal that focused on relocating Madison Square Garden into the west annex of the Farley building. Back to the basics. Stout described current plans for Moynihan Station as a return to Senator Moynihan’s original vision of getting a new station started so that people have an opportunity to see what an asset the Farley building is, and then hopefully it will be possible to “build from there.” Such a new station would relieve commuter congestion at Penn Station, and allow it to undergo needed repairs and renovations.